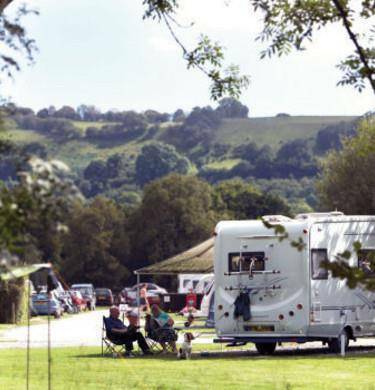 Rhandirmwyn (pronounced ran-dee-mo-n) Club campsite lies just outside the Brecon Beacons National Park. The name means ‘Valley of the minerals’ and is a lead mining area in the Towy Valley. 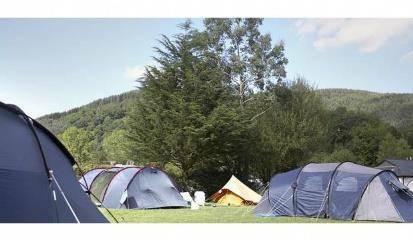 The campsite is situated in the middle of the valley and the lively River Towy run alongside it. The campsite is spacious and well set out with excellent facilities. Surrounded by hills and trees it’s ideal for families or individuals interested in walking, cycling or just relaxing. Head south from the campsite to the Usk reservoir in the National Park. An eight-mile trail wends its way around the shore. Fishing is available here too. The nearby Glasfyndd Forest also has great walking and cycling tracks. Llyn Brianne reservoir is also worth a visit. The road around the reservoir has some breathtaking views. Also visit the subterreanean world of the National Showcaves Centre for Wales. As well as the caves you can visit the dinosaur park, shire horse centre and the Iron Age village. The 13th century hillside Carreg Cenne Castle is south of the campsite near the village of Trapp. Don’t miss a visit to the RSPB Dinas Nature Reserve where you can spot red kites. You can see more red kites as well as ravens and buzzards at Gigrin Farm Bird reserve in the market town of Rhayader.